To view the payroll staffing data for the third and fourth quarters of 2017, click here. Note: This staffing data includes only the direct care staff. Data for RN and LPN Administrative Hours have not been included. In the past, data on nursing home staffing was reported to the Center for Medicare & Medicaid Services (CMS). CMS then posted that information on the Nursing Home Compare website. Those staffing levels were entirely self-reported by the nursing homes themselves with no outside verification. In 2017, CMS began collecting and disseminating staffing figures for U.S. nursing homes through direct day-by-day actual payroll data. This makes the current information, while still not perfect, much more reliable than anything we previously had. CMS is posting this data for each quarter of a given year beginning in 2017. The release date of this information is always several months after the end of the quarter. We will publish it here as we receive it. The Voices for Quality Care Reports are PDF document that include brief research findings on staffing levels and summarize the information in the spreadsheets. The Analysis Spreadsheets These are much shorter spreadsheets that contains the analysis of the data presented in the larger spreadsheet. They contain just a single row for each individual nursing home. They include the total staffing hours average for the nursing home. They also include indications as to whether the home had a pattern of low staffing on week-ends, had any days below 2.0 hours per resident per day, had all days between 3.0 and 3.99, had all days between 4.0 and 4.99, and whether the data included any obvious errors. The Full Spreadsheets are large Excel spreadsheets that contain the full list of all Maryland or DC nursing homes with payroll figures for each day during the 3 month time frame. Day staffing hours are color coded according to staffing levels. 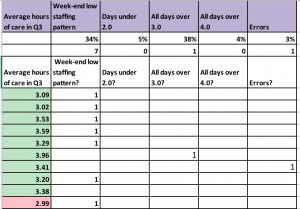 Low staffing on week-ends, homes with days below 2.0 (Maryland only), homes with all days above 3.0, homes with all days above 4.0, and homes with errors in staffing figures are indicated. Within this spreadsheet, one can find the staffing levels for any given nursing home during this time period.